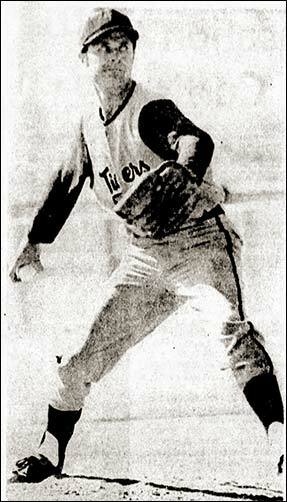 Above - Red Deer right-hander Cliff Ballou fires to an Edmonton Tiger batter in Alberta Major League action. In the outfield is Red Deer centre fielder Al McKee. 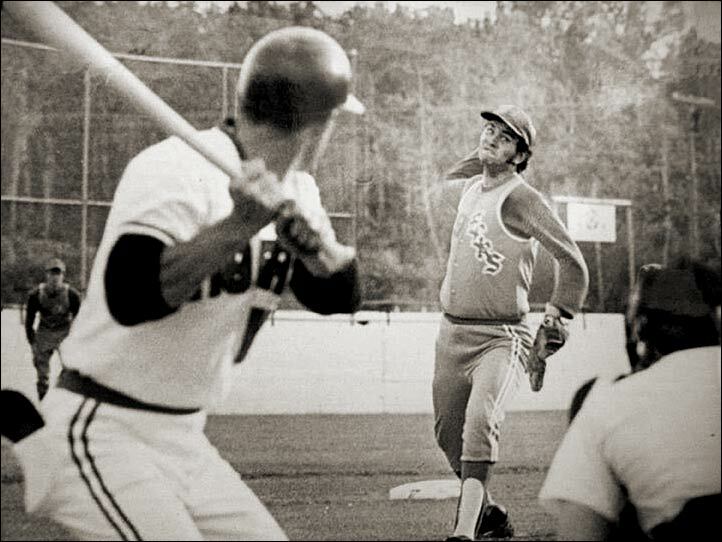 This could be from a May 30th game in Red Deer, the first game of a double-header won by the Elks. 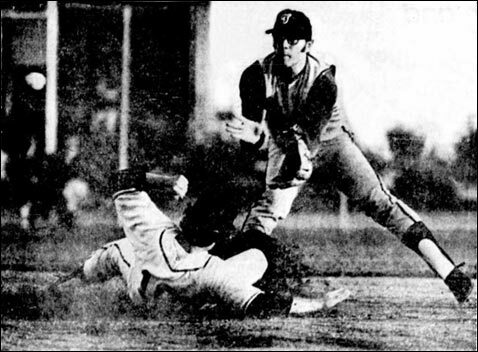 Left - At the 1971 Calgary Tournament, Tom Sharpe of Unity slides into second base ahead of the throw to the Edmonton Tigers' shortstop Ron Watamaniuk. Below - Foothills Giants congratulate each other on their victory over Calgary Cubs in the fifth and deciding game of the final series. Left to right - Phil Kelber, Brian Hogan, Paul Callivan, Hy Lewis, and Tom Changnon. 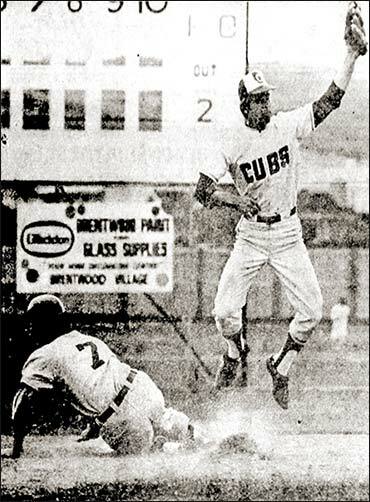 Below left - Calgary Cubs shortstop Al Herback. Right - Cubs' manager John Elick. 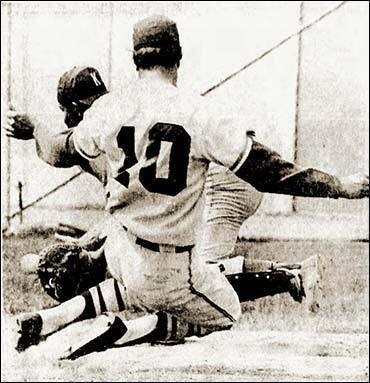 Left - The Calgary Cubs' Ron Johnston (#10) is safe at home as he beats the throw to Kindersley catcher Don Jackson. The teams in the Alberta Major League played an interlocking schedule with teams of the Northern Saskatchewan League. 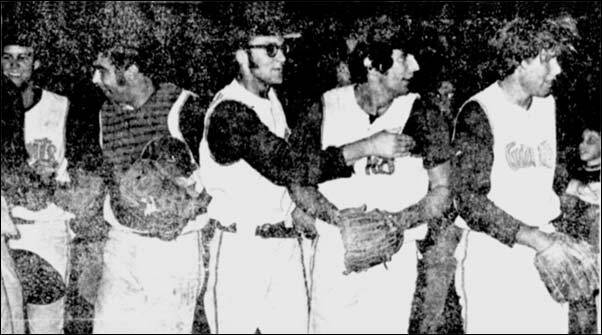 Below left - Bill Chahley, a two time Alberta Major Baseball League pitching champion, is set to pitch the home opener for the Edmonton Tigers. 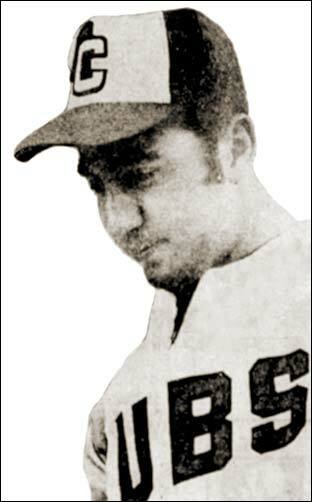 Chahley, was a member of the 1970 Pan-Am Games baseball team. 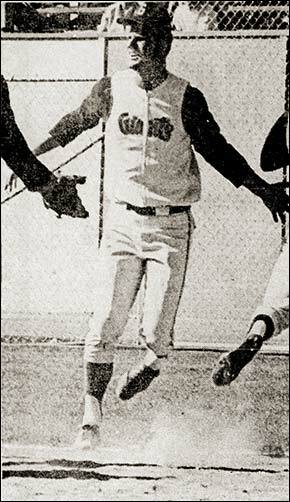 Below right - Stu Heron of the Calgary Giants, the 1970 batting champion (.380) who led the league in average, doubles, triples and RBI.